Shaikha Hayat bint Abdulaziz Al Khalifa, board member of Bahrain Olympic Committee (BOC), president of Arab Table Tennis Federations and member of the Executive Office of the federation, was elected vice-president of the Union of Arab Federations’ executive office recently. Shaikha Hayat was greeted on this decision by Supreme Council for Youth and Sports assistant secretary general and BOC secretary general Abdulrahman Askar. He stressed that Shaikha Hayat is worthy of the position due to her competence and sincerity in working throughout the years of her work in the field of sports at the regional, continental and international levels, and for her achievements in various posts she has occupied over the years. Askar extended his congratulations to Shaikha Hayat on behalf of all members of the BOC and the sports family in the Kingdom of Bahrain in general. 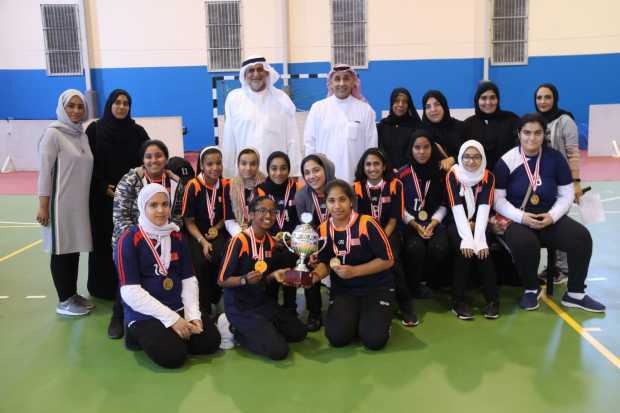 Al Qairawan School won the Girls Intermediate Schools handball tournament by defeating Al Eman school in the final held at A’ali Club sports hall. The tournament was organised by the sport education department at the Ministry of Education. After the end of the match, the Ministry of Education’s physical education, scouting and guidance director Dr Essam Abdulla presents the prizes to the winners. Bahrain Sports Federation for Disabilities held a meeting on Monday to discuss the launch of wheelchair tennis in the Kingdom of Bahrain at its premises. Present were Shaikh Mohamed bin Duaij Al Khalifa, president of Bahrain Sport for Disabilities, Shaikh Abdul Aziz bin Mubarak Al Khalifa, vice-president of Bahrain Tennis Federation, and Khamis Al Muqla, president of Bahrain Tennis Club. The launch will make Bahrain the first in the Gulf region and the fifth in the Arab world to introduce the wheelchair tennis for the disabled. The meeting was also attended also by Sarah Al Shawi, director of Bahrain Sports Federation for Disabilities, Ahmed Al Oraifi, board member, Fuad Al Rowaie, general secretary of Bahrain Tennis Federation, Nadi Mouradi, board member, and Hamdi Abdul Jawad, club manager of Bahrain Tennis Club.